High Performance with Aluminum Heads that do WORK! Built from one of our Dyno tested packages! **Note: air gap intake required+. 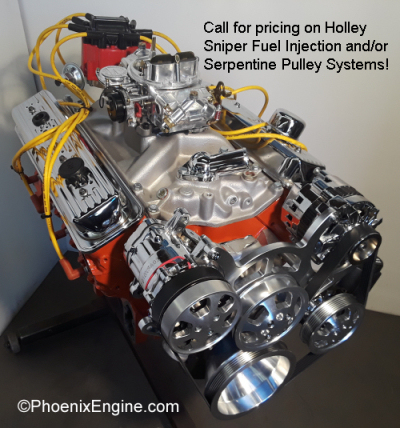 Horsepower rating determined with Holley carburators 750 cfm and up. 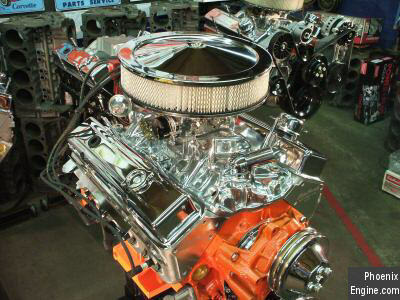 For Higher HP, we recommend the 383 stroker engine or aluminum head with 383 stroker engine. Super shipping rates to all 48 continental states! We also now ship to Hawaii, Alaska, and international destinations! PLEASE CALL FOR MORE PROMOTIONAL PRICING AND SALES! 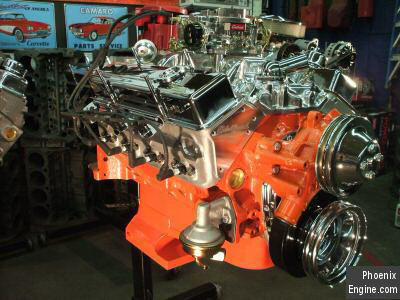 This engine is a 4 bolt seasoned heavy duty Chevy small block. IT WILL RUN ON UNLEADED FUEL+. This is a HOT STREET, HIGH TORQUE engine! It has a great Old School sound like a 'Vette, Camaro, Nova, Chevelle, etc. It would be great in your MUSCLECAR, Street Rod, Hot Rod, Kit Car, Custom Truck, 4x4, or JEEP. Very good Street. Built from one of our Dyno proven, road tested packages. Your specific engine can also be Dyno tested for an additional charge. 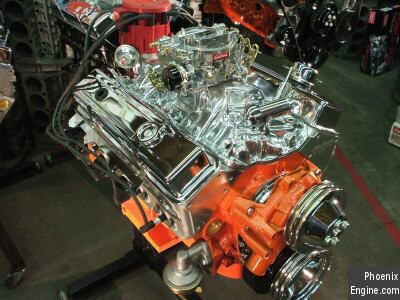 ALUMINUM HEADS: Edelbrock, Dart, or Pro-Filer Street Aluminum heads that do work!! or Holly 750 - ask about jetting for your choice of carb. - Don't forget Fast Track! ProBillet Street is included; MSD 2 pack or 3 pack with 6AL box is extra. 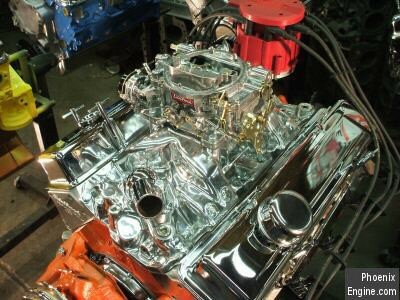 NEW Real Polish Street dual Plan Intake Manifold or aluminum intake manifold. Ask about air gap intake for hood clearance! call on standard transmissions like 4 speed, 5 speed, or 6 speed. Flywheels extra. Some assembly may be needed. All of these New Parts are included !! Much more detailed list of parts and machine work listed below, please scroll down for details. New Intake Included, polished is extra. 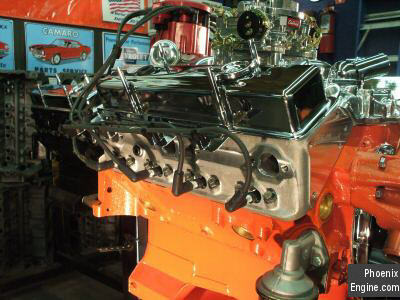 ALUMINUM HEAD (Dart or World or Pro-Filer or Edelbrock) - great STREET heads! Heavy duty thick wall bronze valve guides (guides are stepped so they will not pull through) - great performance street strip! custom order of the engine. Don't forget to call us for roller cam packages! 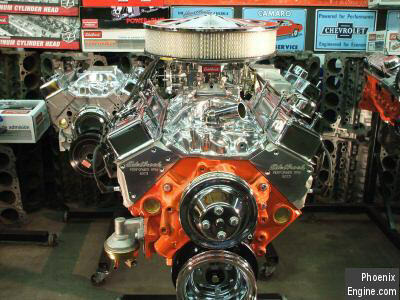 This engine was built from one of our dyno packages! Call about our polished air gap dual plane intake manifold or other great options! ALSO CALL ABOUT OUR NEW KEITH BLACK PISTON ENGINES! Ask about our Fast Track Startup Package! This engine has a one year written warranty. 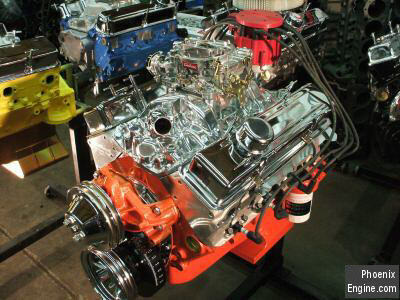 Buyer pays actual shipping costs if unable to pick up engine from our shop in Phoenix AZ. Some state freight restrictions apply. Payment due in full prior to shipping. We accept Visa, Mastercard, Discover, money orders, cashier's checks, and direct deposit. (GET A DISCOUNT WITH A DIRECT DEPOSIT!) Business or personal checks must clear prior to shipping. Arizona residents must add 8.6% sales tax. 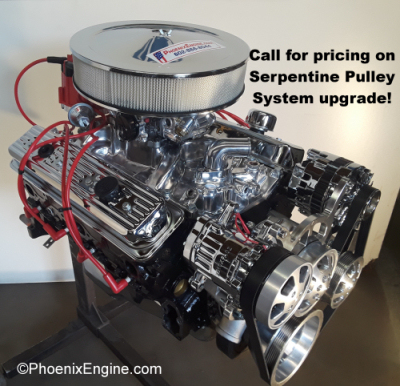 FOR ANY CHANGES NEEDED TO THE LISTING ABOVE, JUST CALL AND WE WILL BUILD A CUSTOM ENGINE PACKAGE FOR YOU FROM 375 HORSEPOWER TO 1025 HORSEPOWER. 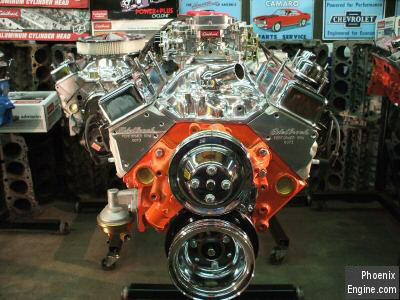 CALL US IF YOU ARE INTERESTED IN A RACE ENGINE!! YOU CAN ALSO CHANGE THE COLOR, CHOOSING FROM OVER 25 DIFFERENT COLORS. 375 HP, 385, 395, 410, 425, 435, 455, 465, 475, 490, 500, ++ CALL FOR MORE! 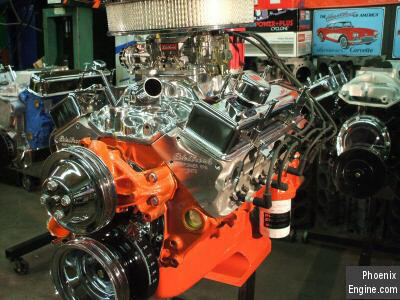 Our Power 4 ® engines are totally REBUILT in our Machine Shop by professionals from start to finish. 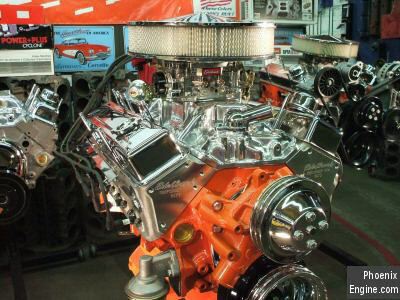 The Power 4 ® Engine Performance Combination was developed from our over 45 years of experience on MUSCLECARS, STREET STRIPS, CUSTOM TRUCKS, 4x4s, and JEEPS. 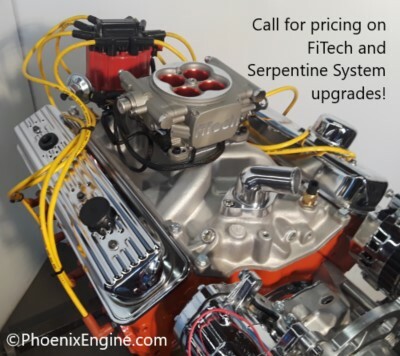 Phoenix Engine.com has built over 140,000 quality engines to date. THIS ENGINE HAS A ONE YEAR WRITTEN WARRANTY! Following are photos of this engine, plus some photos showing our optional FiTech and Serpentine System upgrades.